The excellent media center software XBMC has finally come to Apple TV 2, but beyond being a great media center, if you’re wondering why else you should care I’ll sum it up in one word: 1080p. Yes, using XBMC, you can unleash 1080p video playback on the $99 Apple TV2… the playback suffers from occasional choppiness on uncompressed bluray video, but hey it’s the first release, and could make the ATV2 the cheapest 1080p video playback device on the market. 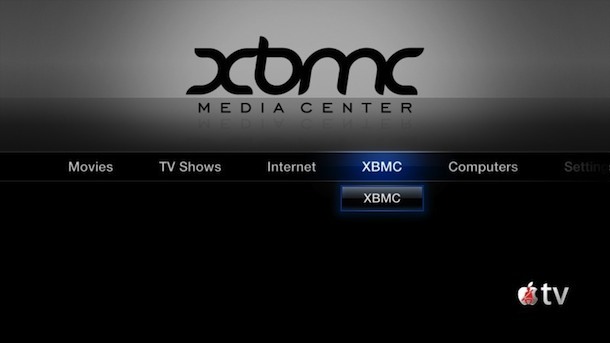 Now that your Apple TV2 is jailbroken, you can install the XBMC software onto it. When XBMC has completed installing, your AppleTV’s built-in media manager FrontRow will restart itself and you will see XBMC in the list of options, just select it to launch XBMC. If you don’t have an Apple TV you can still setup a media center on any Mac by using Plex or XBMC. It’s simple, just download the software, grab an HDMI adapter and AUX cable, and your Mac is now a media center. Oh and while we’re on the topic of XBMC, perhaps less useful but still interesting is that it was also just released for iPhone and iPad. This too requires a jailbreak, and the XBMC app can be found via Cydia. Cool I will give this a go, weekend project! Question: after the tethered boot of the ATV2 is it save to disconnect it completely and move it elsewhere, or will this cause the ATV2 to fail the next time it boots? Every time the ATV2 boots it needs to be connected to a computer for the tethered boot procedure, that’s the major downside to the tethered jailbreaks. Thanks Manish, that clears it up perfectly! I tried the above and it took me serval tries before i figured out that when you install the xbmc on the apple tv2 you will do this WITHOUT the usb connected to the apple tv – so terminal will make the apple tv connect via the net and download and install xbmc. This is in the final steps. Cheapest 1080p playback device on the market? How can that be when the hardware is only 720p capable? Decoding 1080p content and then outputting it at 720p may make this a fairly cheap 720p playback device, but it’s not much use for 1080p content. I’m sorry, but this is why it’s usually a very bad idea to let people just copy/paste commands into terminal. Many have no clue what it all means and what it’s supposed to be doing. That’s just opening doors for disaster. What does that mean in English or is there a fix. Am I too late? My movies download on hulu but then it says that it doesn’t have everything it needs for playback or some such. I even tried myth thing. Changed settings 720 etc. Used default. I have done everything. And it just don’t work. Btw I have done this on my iPad, iphone4 and appletv2 and none will work. All have same error message in log files. I have made a discovery. I guess it’s the “cowards” way out, but if u have a win doze machine in your LAN somewhere. You can install “Play-on” and everything seems to work fine. I have done the seasonpass jailbreak but now I am completely lost as to how to install the XBMC. When i hit the link it just shows code (what do i do with that?) and a screen shot of the xbmc page?? what kind of links I need to do that? I have loaded XBMC works fine except for 2 issues. XBMC drops out to the ATV2 menu at random points in the film. and i seem to have buffer problems. Im having the same problem. It seams to be during fast action parts of a 720p movie(cowboys and aliens).haven’t noticed this happen on any other movies yet. is it possibly because the file is slightly corrupt? Have you come up with a solution? I have jailbroken my Apple TV 2 with seas0nPass and now I want to install xbmc. I have NO clue what password to use. I have used every password I can think of. Please help me know where to find that password. Thank you. What can I do? I have already done a softwarde update of NitoTV. I’m getting port 22: Operation timed out! What do i have to do now? I am in the jailbreak process and stuck on the entering DFU process.. I have tried every combination, plugged in to the wall, not plugged in, etc.. and no luck. One thing I have noticed is that when I hold play/menu that iTunes opens up and pulls up my iPhone. My phone is not plugged in and i have also turned it completely off yet it keeps happening. Can anyone please help?